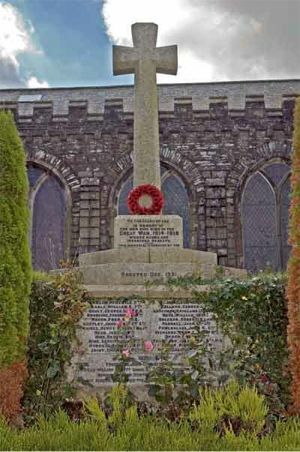 Ugborough's War Memorial stands high on a knoll beside the steps which lead up to the church, on the village side of the churchyard wall in a very prominent position. An inscription on the plinth below states that the memorial was erected in December 1921. 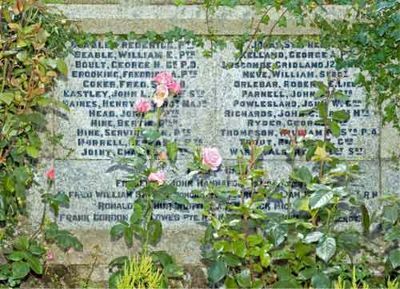 Names are inscribed on the facing side of the base plinth, followed by the date of the Second World War and the names of its fallen. Private Frederick Jacob Beable of the 9th Battalion, the Devonshire Regiment. Son of Edward and Elizabeth Beable and brother of William (see below). Born in the March Quarter of 1882 in Ugborough. Died 29 December 1916 aged 34. Private William Edward Beable of the Training Division, the Royal Marines. Son of Edward and Elizabeth Beable and brother of Frederick (see above). Born in the September Quarter of 1885 in Ugborough. Died 10 May 1917 aged 31. Officer's Cook First Class George Herman Boult of the Royal Navy, HMS Ramillies. Son of Frank and Jane Boult and husband of Beata Boult ( née Whitting) of Bath. Born in the September Quarter of1894 in Heavitree, Exeter. Died 6 March 1919 aged 24. Private Frederick Amos Brooking of the 2nd Battalion, the Devonshire Regiment. Son of James and Harriett Brooking, of Diptford, South Brent. Born in the June Quarter of 1895 in Diptford. Died 5 September 1917 aged 22. Stoker First Class Fred Coker* of the Royal Navy, HMS Amphion. Son of William George and Hannah Coker, of Ugborough. Born in the September Quarter of 1894 in Ugborough. Died 6 August 1914 aged 20. Chief Stoker John Luke Eastley of the Royal Navy, HMS Dublin. Son of Robert and Elizabeth Eastley of Little Bittaford, Ugborough and husband of Emily Alice Eastley ( née Kelland) of Parsonage Cottage, Ugborough. Born in the March Quarter of 1885 in Ugborough. Died 9 June 1915 aged 30. Regimental Sergeant Major Henry ("Harry") Boyle Haines of the 7th Coy, Haynes Park Signal Department, the Royal Engineers. Son of William and Sarah Haines and husband of Elizabeth Jane Haines, of I, Holland Rd., St. Thomas, Exeter. Born in the March Quarter of 1853 in Swansea. Died 7 May 1916 aged 63.Served in the South African Campaign. This man's connection with Ugborough is not yet known. Private John Thomas Head of 1/4 Battalion, the Devonshire Regiment. Son of Frederick and Mary Ann Head, of 207, Highfield Terrace, Bittaford. Born in the June Quarter of 1898 in Ugborough. Died 3 February 197 aged 18. Rifleman Bertie Hine posted to the 1st Battalion, the King's Royal Rifle Corps but formerly 31459 of the Dorsetshire Regiment. Son of George and Mary Hine of 16 Lutterburn St, Ugborough. Born in the March Quarter of 1899 in Ugborough. Died 23 August 1918 aged 20. Private Servington Hine posted to the 5th Battalion, the Royal Berkshire Regiment but formerly 316085 of the Devonshire Regiment. Son of Richard and Amelia Hine of 22 Lutterburn St.,Ugborough. Born in the March Quarter of 1899 in Ugborough. Died 26 August 1918 aged 20. Private Cephas Hurrell of the 1/4 Battalion, the Devonshire Regiment. Son of James and Hannah Hurrell of Taylor's Court, Ugborough. Born in the December Quarter of 1892 in Ugborough. Died 29 July 1918 aged 25. Rifleman Charles Henry Joint posted to the 1/8th Regiment, the Royal Irish Rifles but formerly TR/8/18297 of the 37th Territorial Reserve Battalion.. Son of George and Emily Joint of Church Cottages, Ugborough. Born in the March Quarter of 1899 in Ugborough. Died 5 September 1918 aged 19. Private Stephen Samuel Jonas of the 2nd Royal Marine Battalion, the Royal Marine Light Infantry. Son of Levi and Mary Jonas of Shobrooke, near Crediton and husband of Beatrice Jonas (née Jonas). Born in the June Quarter of 1887 in Shobrooke. Died 8 February 1917 aged 30. George Alfred Kelland. Son of George and Mary Kelland of Yealmpton. Born in the March Quarter of 1900 in Yealmpton. His military record is not yet known - he may have been a Boy entrant in the Royal Navy. Second Lieutenant Cridland John Luscombe of the 9th Battalion, the Bedfordshire Regiment. Son of John and Ida Luscombe of Marridge, Ugborough. Born in the September Quarter of 1897 in Ugborough. Died 3 May 1917 aged 19. Lance Sergeant William Neve of the 5th Battalion, the Devonshire Regiment. Son of Mr. and Mrs. F. Neve, of 11, Fleet View, Bittaford. Born in 1891 in County Cork. Died 12 December 1917 aged 26. Lieutenant Robert Evelyn Orlebar of the 2nd Battalion, the Middlesex Regiment. Son of Lt. Col. and Mrs. Orlebar, of Rutt House, Ivybridge. born in the September Quarter of 1894 in Walmer, Kent. Died 9 January 1915 aged 20. 280364 Petty Officer Stoker (Pensioner) John Henry Parnell of the Royal Navy, HMS Anchusa. Husband of Rosina Parnell (née Kingdon) of 15 Oxford Avenue, Mutley, Plymouth. Born in Lanark, Scotland 8 August 1874. Died 16 July 1918 aged 44.. Believed to be Gunner William John Powlesland of No. 3 Depot, the Royal Garrison Artillery. Brother of Mrs. Eliza Radford, of 12, St. Anne's Rd., Heavitree, Exeter. Died 23 September 1915. Armourer's Mate John Charles Richards of the Royal Navy, HMS Laurentic. Son of John and Annie Richards, of Blackadon, Ivybridge. Presumed by the age given below to have been born in 1889 but he has not yet currently been traced to Ugborough although he is described as a native of that place. Died 25 January 1917 aged 28. Private George Henry Ryder of the 2nd Battalion, the Devonshire Regiment. Son of the late James Ryder and Phyllis Ryder of Mill Cottages, Lee Mill Bridge, Ivybridge. Born in the June Quarter of 1898 in Totnes. Died 27 October 1917 aged 19. Stoker 1st Class William Piper Thompson of the Royal Navy, HM Submarine J6. Son of Margaret Heath (formerly Thompson), of Ugborough. Born in in the September Quarter of 1897 in Ugborough. Died 15 October 1918 aged 21. Gunner Richard Thomas Leat Trout of the 48th Siege Battery, the Royal Garrison Artillery. Son of Richard and Mary Ann Trout, of Ugborough and husband of Mary Elizabeth Trout (née Prowse) of Ugborough. Born in the March Quarter of 1879 in Ugborough. Died 19 August 1917 aged 38. Flight Sergeant Albert Edgar Warne of the 39th Training Depot, the Royal Air Force. Son of Richard and Jane Warne, of 1, Sunny Dale, Bittaford. Born in the June Quarter of 1895 in Ugborough. Died 13 October 1918 aged 23. Buried in St. Peter's Churchyard, Ugborough. Awarded the Albert Medal (see below). On the 26th January last, while flying in England, a pilot when attempting to land lost control of his machine, which crashed to the ground from a height of about 150 feet, and burst into flames. Flight Sergeants Warne and Cannon went to the rescue of the pilot at great personal risk, as one tank of petrol blew up and another was on fire; moreover, the machine was equipped with a belt of live cartridges, which they dragged out of the flames. They managed to extricate the pilot, who was strapped to the burning plane, but he died shortly afterwards from his injuries and burns." Private Frank Gordon Fellowes of the Royal Army Medical Corps. Son of Mr. and Mrs. J. E. Fellowes; husband of M. Fellowes, of Whitchurch. Died 3 June 1945. Chief Petty Officer Stoker Frederick John Hannaford of the Royal Navy, HMS Exeter. Son of William John and Mary Ellen Hannaford; husband of Henrietta Hannaford, of Devonport. Born in the December Quarter of 1905. Died 31 March 1945 aged 39. Sergeant William John Herd of 12 Battery, 6HAA Regiment, the Royal Artillery. Son of Thomas Conrad and Emma Jane Herd, of Ugborough and husband of Alice Maude Herd, of Ugborough. Died 11 March 1944 aged 34. Petty Officer Steward George William Horton of the Royal Navy, HMS Hood. Son of George Henry and Kate Horton; husband of Rosemary Horton, of St. Austell, Cornwall. Born in the June Quarter of 1910 in Crediton. Died 24 May 1941 aged 31. Mentioned in Despatches. Able Seaman Jack Hicks of the Royal Navy, HMS Prince of Wales. Son of William John and Mary Elizabeth Hicks, of Ivybridge. Died 10 December 1941 aged 21. Commander Alfred William Sprott of HMS Dragonfly,(which he came out of retirement to captain), the Royal Navy. Born 8 September 1893. Joined the Navy 15 May 1906. Husband of Winifred (née Hall). Died 14 February 1942, aged 48. (HMS Dragonfly was attempting to rescue British occupants from Singapore which fell to the Japanese 14 February 1942. His ship was attacked from the air and severely damaged but he managed to beach her before she sank and some of the crew and passengers survived later to become prisoners of the Japanese). His connection with Ugborough is not yet known. Engine Room Artificer 4th Class Ronald Arthur Worth of the Royal Navy, HMS Gloucester. Son of Arthur John and Hilda Elizabeth Worth, of South Brent. Died 22 May 1941 aged 23.